We pitch three front wheel drive hatchbacks against each other - the top selling Ford Fiesta 1.1L, the up-and-coming VW Polo GLS and the new Opel Kadett LS. They all have outstanding virtues, such as the Polo's excellent cornering ability, the Kadett's interior space and the Fiesta's ease of maintenance. Read on to see which we rate as the best buy. ANNOUNCED in July 1976, but not available in Britain until February 1977, the Fiesta is Ford's first front wheel drive car and follows the popular transverse engine, 3 door hatchback concept. Six models were originally available:- Base (957 high or low compression engine); L (957 or 1117cc engines); S (1117cc engine) and Ghia (957 or 1117cc engine). Later. S, GL and Ghia 1300 versions and an 100 GL were introduced to complement the range. Impressions: Although very similar to many of its rivals, it is difficult to fault the Fiesta as it has an excellent combination of performance, economy, handling and accommodation. The ride is quite firm with driver only on board but it softens up with a load and copes well with bumpy roads. The steering is light, it's nicely high geared and the Fiesta corners well, with modest roll and only a trace of typical front wheel drive understeer. Accommodation is well up to the class level and only hard drivers will do worse than 40mpg. Guarantee: 12 months' unlimited mileage. INSTEAD of opting merely for a hatchback as on the Fiesta and Polo, Opel have chosen multiple body styles with a choice of power units. For the L and LS models the engine gives 60bhp and the 1.35 engine in the GL, SR and Berlins gives 75bhp. The car will be introduced in Britain as the Vauxhall Astra later this year. Impressions: At 13ft. 1in. the Kadett is 18in. longer than the Polo and Fiesta and its all round appearance is slightly larger, but it competes well on price and appearance. The LS is quite a quick car, cruising happily at SOmph and accelerating as well as its rivals, although the slightly low gearing does allow engine noise to intrude somewhat. The gearchange is much better than on most front wheel drive cars and cornering power is well up to the standards of much longer established front wheel drive models. The engine is slightly bigger than its two rivals in this test so the magic 40m pg might be difficult to achieve. Guarantee: 12 months unlimited mileage. ANNOUNCED in March 1975 at the Geneva Show, the Polo did not reach Britain until February 1976. ft is essentially a scaled down VW Golf, having an overall length of 11ft. 7in. and weighing 143lbs less than the Golf. With a transversely mounted engine driving the front wheels, the Polo is available only as a three door hatchback, although the Derby model, based on the Polo is a conventional saloon. Three models are available, the N (£3115), the L (£3439) and the GLS. Impressions: When it was first announced, road testers were unanimous in their opinion that the Polo was the best "mini" car on the road. Its combination of fleet footed roadholding, light steering, powerful braking and firm yet comfortable suspension made it a must for keen drivers. 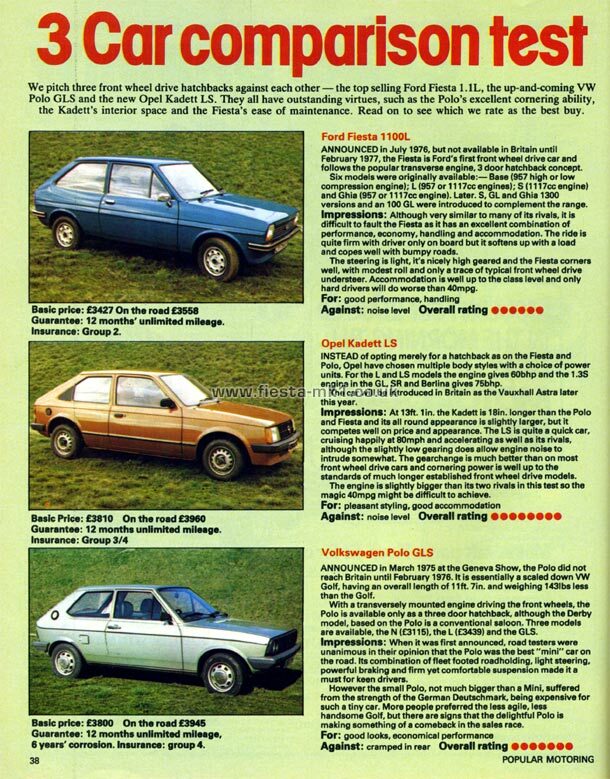 However the small Polo, not much bigger than a Mini, suffered from the strength of the German Deutschmark, being expensive for such a tiny car. More people preferred the less agile, less handsome Golf, but there are signs that the delightful Polo is making something of a comeback in the sales race. Guarantee: 12 months unlimited mileage, 6 years' corrosion.